10 Watts Peak/5 Watts RMS power from the 2.25 inch driver design amplifies your device's audio in any room. 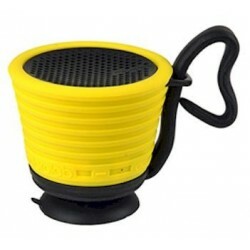 Small speaker; big sound. Plug in the power adapter and connect your smartphone, tablet or computer via the headphone jack (3.5mm) input. This portable speaker is simple to setup and easy to move around.